Trunks: Single, usually branched above middle, occasionally with branches near ground; crown irregular; bark dark-brown with light blotches, slightly furrowed on old trunks. Twigs: Rigid, glabrous, dark brown; usually 2 prickles at each node; prickles flat, broad-based, curved downward; leaf scars crescent-shaped or half-round; bundle scars 3; buds small, spherical, covered with red woolly hairs. Leaves: Alternate, odd pinnately-compound, deciduous, 2 to 10 inches long, aromatic; stalk about 1.2 inch long, pubescent; leaflets 5-11, nearly sessile, egg-shaped, 1.2 to 2.4 inches long, 3/5 to 1.2 inch wide; upper surface dark green, slightly rough, glandular-dotted; lower surface paler, veins pubescent; margin entire or finely toothed; tip abruptly pointed; base rounded or blunt. 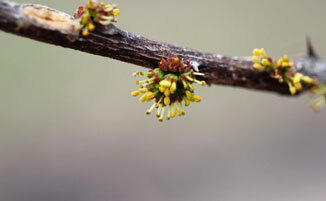 Flowers: Before leaves, inconspicuous, dioecious (male and female flowers on separate trees); staminate flowers in clusters of 2-10; stalk 1/8 to 1/6 inch long; calyx absent; petals 4-6, egg-shaped, 1/12 to 1/10 inch long, green; tip with red fringe; stamens 5-6; anthers small, yellow; pistillate flowers 2-10, in umbel-like clusters; stalks 1/8 to 1/6 inch long, calyx absent; petals similar to staminate; pistils 2-5; styles 1/12 inch long, green; stigmas spherical, green. Fruit: July-August; dense clusters; stalk 1/10 inch long; spherical, fleshy, about 1/5 inch in diameter, red, surface pitted, strongly spice-scented; seed oval, about 1/6 inch long, glossy black, finely pitted. Habitat: Rocky hillsides, open woods, woodland edges, roadsides, prairie ravine thickets; usually in calcareous soils. Uses: Native Americans steeped the bark and used the liquid as a wash for itching; took it for colds, fevers, and coughs; and rubbed on dog noses to enhance their scent. The inner bark was pounded and chewed, smoked, or packed around a tooth for toothaches. A poultice of crushed inner bark was applied for rheumatism. Young men sometimes used the fruits as perfume. Comments: Prickly ash forms thickets from underground, creeping stems. The common name "toothache tree" was given because oil derived from the fruit was used as a home remedy for toothaches. The wood is soft, porous, pale yellowish-brown. Greek xanthos "yellow" and xylon "wood".